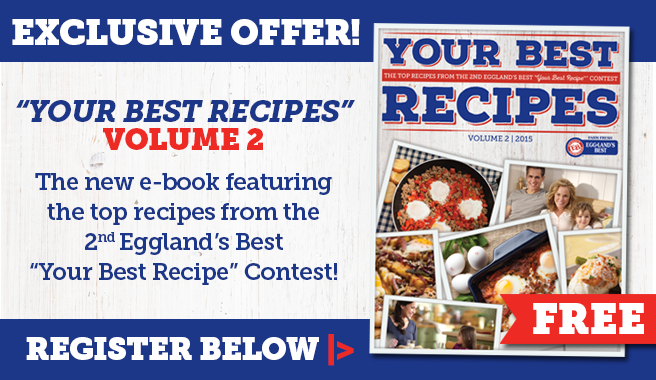 Download your copy of the NEW Eggland’s Best eCookbook “Your Best Recipes” Volume 2 – The Top Recipes from the 2nd EB Your Best Recipe Contest today! It is FREE for EB fans, courtesy of Eggland’s Best. This eCookbook is a collection of the top 20 semi-finalist and winning recipes from our 2nd “Your Best Recipe” Contest. Also included in Volume 2 are the top five recipes from the new category; “Kid Friendly” recipes. “Your Best Recipes” Volume 2 celebrates the very best EB recipes from kitchens across the country. From Breakfast to Dessert, or even recipes the whole family can do together, these easy-to-make delicious recipes will become instant favorites in your kitchen.